Chocoholics rejoice! 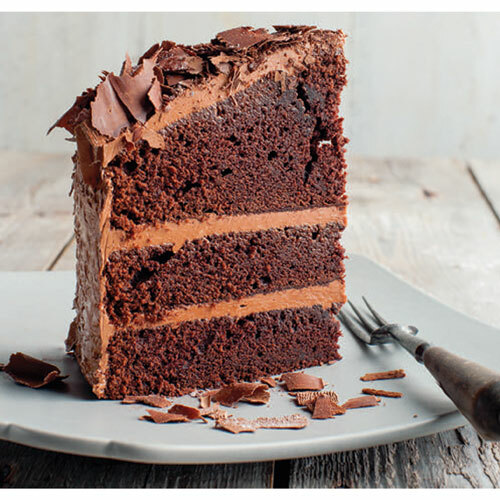 The Devil’s Food Cake is the ultimate chocolate indulgence! 1. Preheat the oven to 325F. Grease, line with parchment paper, and dust with cocoa three 8mm round cake pans. 2. Sift the cocoa and add to the boiling water and mix. When cooled slightly, add in the milk. 3. Cream the butter and sugar together until light and fluffy. Add in the vanilla extract and beat in the eggs a little at a time, scraping down every so often. 4. Sift the flour, baking soda, and salt into a bowl and add to the egg batter, alternating with the cocoa batter and combine well. 5. Divide the batter evenly into the prepared cake pans and bake in a preheated oven for 35 minutes or until a toothpick inserted into the center comes out clean. 6. Remove from the oven, let cool for 10 minutes in the pan, and then turn out onto a wire rack. 7. Now, make the frosting. Put the egg yolks in a large bowl. Bring the sugar and water to the boil until the temperature reaches 244F. Then start whisking the egg yolks. When the sugar reaches 248F, remove from the heat and let the bubbles subside. Add to the yolks in three batches, turning off the mixer between additions. Add in the cubed butter and slowly fold in the melted chocolate and combine well. 8. Now, you’re ready to assemble the cake. Remove the parchment paper and place one cake layer onto a serving plate and spread frosting on the top. Add a second layer and repeat with more frosting. Add the final layer and then cover the entire cake with the remaining frosting. Sprinkle with chocolate shavings if you like. Create them using a peeler or knife.